Paramahansa Srimat Swami Nigamananda Saraswati Deva (1879 A.D. – 1935 A. D.) is an extraordinary Sadhak and spiritual preceptor of India. 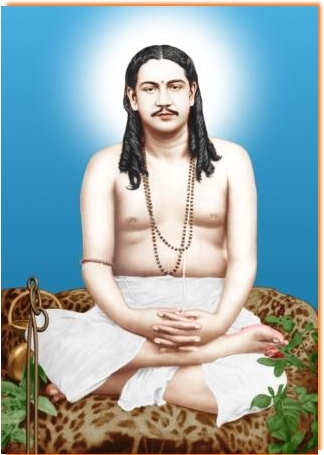 He attained perfection in tantra, jnana, yoga, and prema, all four spiritual practices. On attaining the ultimate truth in Nirbikalpa Samadhi, he came to public with sacred responsibility of Guru by the instruction of Jagadguru. America Saraswata Sangha is a branch of Nilachala Saraswata Sangha, Puri. Devotees obtain membership to Sangha upon their desire to love Shri Shri Thakura, his ideology and to respect SanghaNiti (principles of Sangha). The Sangha was formed with three principles per His instruction.
. Leading ideal household life.
. Establishment of Combined Power. Over 75 years Nilachala Saraswata Sangha has been publishing books, journals on Paramahansa Srimat Swami Nigamananda Saraswati Deva in Odia, Hindi, and English. In addition, Assam-Bangiya Saraswata Matha has been publishing books in Bengali, Hindi, and English. Bhubaneswar - 751 022, Orissa, India. After establishing Saraswata Sangha, Shri Shri Thakura derived utmost satisfaction by initiating the practice of holding the summit conference (Sammilani ) of his devotees. He deigned to grant to his disciples the privilege of having an easy access to him. One of his principal objectives is formation of ideal household life (Adarsha Grihastha Jiban Gathan). America Saraswata Sangha (AMSAS) is a religious organization. It is registered as a non-profit 501(c)(3) religious organization with the State of North Carolina. The goal of AMSAS is to help its members achieve spiritual enlightenment. It is a branch sangha of (NSS), Puri, India. NSS was established by Paramahansa Shrimat Swami Nigamananda Saraswati Deva on August 24, 1934.